The point to note is that this body of gas (or whatever substance) stores an amount of energy U that is directly proportional to the temperature (T), and Nk/(γ–1) is the constant of proportionality. We can also phrase it the other way around: the temperature is directly proportional to the energy, with (γ–1)/Nk the constant of proportionality. It means temperature and energy are in a linear relationship. [Yes, direct proportionality implies linearity.] 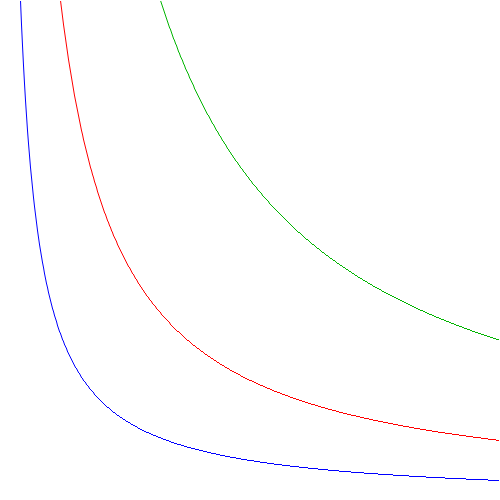 The graph below shows the T = [(γ–1)/Nk]·U relationship for three different values of γ, ranging from 5/3 (i.e. the maximum value, which characterizes monatomic noble gases such as helium, neon or krypton) to a value close to 1, which is characteristic of more complicated molecular arrangements indeed, such as heptane (γ = 1.06) or methyl butane ((γ = 1.08). The illustration shows that, unlike monatomic gas, more complicated molecular arrangements allow the gas to absorb a lot of (heat) energy with a relatively moderate rise in temperature only. We’ll soon encounter another variable, enthalpy (H), which is also linearly related to energy: H = γU. From a math point of view, these linear relationships don’t mean all that much: they just show these variables – temperature, energy and enthalphy – are all directly related and, hence, can be defined in terms of each other. We can invent other variables, like the Gibbs energy, or the Helmholtz energy. In contrast, entropy, while often being mentioned as just some other state function, is something different altogether. In fact, the term ‘state function’ causes a lot of confusion: pressure and volume are state variables too. The term is used to distinguish these variables from so-called process functions, notably heat and work. Process functions describe how we go from one equilibrium state to another, as opposed to the state variables, which describe the equilibrium situation itself. Don’t worry too much about the distinction—for now, that is. Let’s look at non-linear stuff. The PV = NkT = (γ–1)U says that pressure (P) and volume (V) are inversely proportional one to another, and so that’s a non-linear relationship. [Yes, inverse proportionality is non-linear.] To help you visualize things, I inserted a simple volume-pressure diagram below, which shows how pressure and volume are related for three different values of U (or, what amounts to the same, three different values of T). The internal energy U changes because (a) we add or remove some heat from the system (ΔQ), (b) because some work is being done (by the gas on its surroundings or the other way around), or (c) because of both. Using the differential notation, we write: dU = dQ – dW, always. The (differential) work that’s being done is PdV. Hence, we have dU = dQ – PdV. When transferring heat to a system at a certain temperature, there’s a quantity we refer to as the entropy. Remember that illustration of Feynman’s in my post on entropy: we go from one point to another on the temperature-volume diagram, taking infinitesimally small steps along the curve, and, at each step, an infinitesimal amount of work dW is done, and an infinitesimal amount of entropy dS = dQ/T is being delivered. The total change in entropy, ΔS, is a line integral: ΔS = ∫L dQ/T = ∫L dS. That’s somewhat tougher to understand than economics, and so that’s why it took me more time to come with terms with it. 🙂 Just go through Feynman’s Lecture on it, or through that post I referenced above. If you don’t want to do that, then just note that, while entropy is a very mysterious concept, it’s deceptively simple from a math point of view: ΔS = ΔQ/T, so the (infinitesimal) change in entropy is, quite simply, the ratio of (1) the (infinitesimal or incremental) amount of heat that is being added or removed as the system goes from one state to another through a reversible process and (2) the temperature at which the heat is being transferred. However, I am not writing this post to discuss entropy once again. I am writing it to give you an idea of the math behind the system. The U + PV quantity on the left-hand side of the equation is the so-called enthalpy of the system, which I mentioned above. It’s denoted by H indeed, and it’s just another state variable, like energy: same-same but different, as they say in Asia. We encountered it in our previous post also, where we said that chemists prefer to analyze the behavior of substances using temperature and pressure as ‘independent variables’, rather than temperature and volume. Independent variables? What does that mean, exactly? Just write it all out and you’ll find it’s the same thing, exactly. It just introduces another coefficient, α, i.e. the coefficient of (cubic) thermal expansion. If you find this formula is easier to remember, then please use this one. It doesn’t matter. ΔQ = T·(ΔV/ΔT)·ΔP = dQ = T·(∂V/∂T)P·dP, which is what we’ve got to do here, for our analysis of (∂H/∂P)T.
Hence, dH = dQ + VdP becomes dH = T·(∂V/∂T)P·dP + V·dP, and dividing all by dP gives us what we want to get: dH/dP = (∂H/∂P)T = T·(∂V/∂T)P + V.
[…] Well… NO! We don’t have the minus sign in front of T·(∂V/∂T)P, so we must have done something wrong or, else, that formula above is wrong. The formula is right (it’s in Wikipedia, so it must be right :-)), so we are wrong. Indeed! The thing is: substituting dT, dV and dP for ΔT, ΔV and ΔP is somewhat tricky. The geometric analysis (illustrated below) makes sense but we need to watch the signs. Now, in case you still wonder: what’s the use of all these different expressions stating the same? The answer is simple: it depends on the problem and what information we have. Indeed, note that all derivatives we use in our expression for dH expression assume constant pressure, so if we’ve got that kind of data, we’ll use the chemists’ representation of the system. If we’ve got data describing performance at constant volume, we’ll need the physicists’ formulas, which are given in terms of derivatives assuming constant volume. It all looks complicated but, in the end, it’s the same thing: the PV = NkT equation gives us two ‘independent’ variables and one ‘dependent’ variable. Which one is which will determine our approach. Does that make sense? If dH/dU = γ, then H must be some linear function of U. More specifically, H must be some function H = γU + c, with c some constant (it’s the so-called constant of integration). Now, γ is supposed to be constant too, of course. That’s all perfectly fine: indeed, combining the definition of H (H = U + PV), and using the PV = (γ–1)U relation, we have H = U + (γ–1)U = γU (hence, c = 0). So, yes, dH/dU = γ, and γ = CP/CV. So… What’s left? Well… If you’d google the Wikipedia article on enthalphy in order to check if I am not writing nonsense, you’ll find it gives γ as the ratio of H and U itself: γ = H/U. That’s not wrong, obviously (γ = H/U = γU/U = γ), but that formula doesn’t really explain why γ is referred to as the specific heat ratio, which is what I wanted to do here. This entry was posted in Mathematics, Physics and tagged energy, enthalpy, entropy, state functions. Bookmark the permalink. ← Is gas a reversible engine?